Every day's a fine day when you find a Jack Chick comic! I consider myself a moderately modern man. I dig the Internet, this cavalcade of raw data and ranting that has changed everything in the past decade or so; I love my DVD player and my iMac. 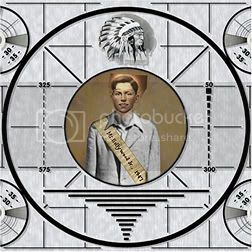 However, recently we decided to renounce some modernity and canceled our cell phone service. I hate with the fiery passion of a thousand red-hot suns the creeping incivility cell phones have dumped on our society. I'm biased. I don't really LIKE talking on the phone. I don't really WANT to feel connected with everybody else in the universe, and I LIKE the idea of being "off the grid." I get enough communication at work, so the off hours are family time. I did succumb to peer pressure and get us a cell phone shortly after 9/11, when it suddenly seemed hugely important to be ready for emergencies. But in the 4 years since, I think I've used the phone less than 100 times, and almost all of the calls between my wife and I. None of them emergencies, really. So it was decided we could spend the $20 a month our bare-minimum plan costs on something else. Heck, these days if you get in a fender-bender or something chances are someone will have a cell phone around anyway. Reams of words have been written already about the rudeness cell phones (or rather, some of their owners) seem to contribute to life - the calls during movies, restaurant dinners, funerals, what-have-you -- the way complete strangers have no problems about broadcasting their conversations with others in public places. Maybe their brains are just wired differently; the part that thinks about other people is missing. Perhaps it's the part of me that hated being a "trendie" back in high school, but if I can help it I don't really want to be lumped in with the cell-phone zombies. I'm not saying having one is bad, and yeah, most of the people who have them are perfectly nice and respectful with them - it's that 10% of yahoos broadcasting that "I just walked into the supermarket and now I'm going to get some Cheez Whiz," the ones who yak on their phones while on a wilderness hike, or the ones who take a cell phone call WHILE TALKING WITH YOU... them I don't like so much. The thing is, do you really need it? How many of the zillions of cell phone calls made today are essential? Not to get all zen, but lately, I find myself into simplifying... and cell phones complicate, it feels like to me. I wouldn't say I'll never have a cell phone again - but you know, I've looked at my life and it just ain't something I need right now. I'm just saying no. The dial tone is empty. So I was walking to work this morning, and out there just on the street as I was bopping along, I found a complete 6-DVD collection boxed set of "The O.C. : The Complete First Season" lying in the road. Just right there in the street. Today is trash day, but still, that's wacky. The case and box are kind of beat up, as if it were thrown out of a moving car (a most unwanted birthday present? ), but the discs inside actually all look OK, although I haven't tried to play them yet. Quite bizarre, that's like a $50 set. The punchline - I've never watched "The O.C.," although I've heard good things about it. Guess now I've got a chance. It's too beat up to eBay, anyway. See, Fridays are fun! • Read my review of "The 40-Year-Old Virgin" here. Me likey. • My New Zealand in-laws are off for a month-long trek to China this weekend. Meanwhile, I sit here at a desk. Yeah, I feel really sorry for them too. Good luck on the trip, Peter and Sylvia! • Man, my wrist hurts. After working around computers for the last decade or so, I seem to be developing carpal tunnel problems in my mouse hand. Owch owch owch. You can use a computer for years and all of a sudden problems develop, apparently. The weird thing is, I'm left-handed, but I've always used my mouse with my right hand, because that's the way most computers are set up. Now that using the mouse causes stabs of searing pain in my wrist, to give it a rest I'm trying to use the mouse with the southpaw. Which is amazingly difficult, all things considered. I'm down to about 3/4 normal speed at work and other typing until I get the hang of this. I always thought I was immune to carpal tunnel issues, but that's what I get for being cocky, and for having appallingly bad posture at the computer. I'm too tall for most desk set-ups at 6' 2", and crouching down to reach the equipment has done its damage. Any remedies besides lots of Ben Gay and rest? "Not being declared and seeing" is, but it means thing." Because I have little time and less inspiration to write a post today -- I present the first paragraph of yesterday's post translated into Japanese and then back into English again through the wonders of Babelfish. Honestly, you could spend all day doing this. This blog looks so cool in Russian. "Like other time of your life there is no your 1st grade of the university. The raw materials of insanity happen. I Mississippi of the far far side which I from the high school of bright California end completely in another world - the magnificence, the traditional did in 1990 and rather than in the university which makes the getting wet like the demonian being used for I, deep south it jumped. I now possessed strange accent, I "was the California man, whether or not I the surf do many times," rather than and me being asked, me it counts it is possible, you obtained, (explaining, I did not sink for the people, you raised 200 miles from the ocean). I the people of various diversified oddball of the dormitory -- the boundary line where the maniac, the black people, race discrimination principle person, hip man, hippie and jocks intelligence are late, with me in the variety when my itself volition probably will not pass the time under any condition, but still just a little the cool mostly kind of people it met. There like everyone, I when still I was brought up me, had done the fact that is who was solved. As for me candidly, you must do vibe, concerning in detail my university day, as for obtaining entirely. "Not being declared and seeing" is, but it means thing." Your freshman year of college is like no other time in your life. Crazy stuff happens. In 1990 I leapt like a madman from high school in sunny California to a grand, tradition-drenched college in far-off Mississippi, where I ended up in an entirely different world than I was used to, the Deep South. I had a funny accent now, I was the "California dude," and I got asked if I surfed more times than I can count (explaining I grew up 200 miles from the ocean didn't sink in for people). I met all sorts of oddball people in the dormitory -- freaks, geeks, black folks, racists, hip dudes, hippies, borderline mentally retarded, jocks -- mostly the kind of people I never would have hung out with of my own volition, but it was still kinda cool. 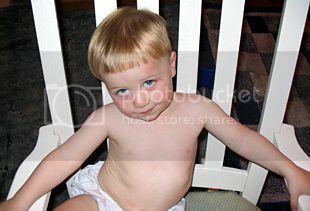 Like everyone else there, I was still working out who I was going to be when I grew up. I'd tell you more about my college days, but frankly, to get the vibe, all you have to do is watch "Undeclared." "Undeclared" was one of those great lost TV shows, true and funny beyond belief but somehow it never quite found an audience and got canned after just 17 episodes. It's stayed a cult favorite, and finally, "Undeclared: The Complete Series" came out on DVD last week, and I picked it up and have been having a ball reliving this too-short comedy's lifespan. "Undeclared" premiered right around 9/11, and the creators admit nobody was in the mood for a "stupid college comedy." But I watched it religiously during its short run, and loved it - funny, smart and with a variety of great likable characters, it captured the "anything goes" atmosphere for freshman year like nothing else. Set in the fictional University of North Eastern California, it followed amiable doofus Steven (Jay Baruchel, channeling a young Tom Hanks) and his newfound friends stumbling along their first months in college. The series touched on frat parties, keggers, buying fake term papers, religion, left-behind boyfriends and all the strange things that come with leaving home for the first time. Living in the dorm tested people -- of my three freshman year roommates, not one lasted past sophomore year. People, given so much freedom, couldn't always hack it. I remember one girl with a haunted look realizing she had a 0.0 grade point average after the first semester. She'd been to classes twice. Anyway, "Undeclared" sums up the spirit of those times with a lot of good laughs. Thank god we no longer live in those dark primitive times when canceled TV shows disappeared forever. The DVD set is packed with extras, including tons of deleted scenes, commentaries and a ton of stuff on the fourth disc I haven't even gotten to yet. Despite the low ratings, creator Judd Apatow (the man also behind the equally brilliant, slightly more serious "Freaks & Geeks" and the director of the just-released "40-Year-Old Virgin") got a wide variety of famous friends to stop by for some witty guest appearances, including Will Ferrell, Ben Stiller and Adam Sandler. I don't think I'd ever want to live in a dormitory again, but there was something essential about the good and bad moments I had in those 10 months or so spent in a building with hundreds of sweaty, frantic and confused other post-teens. "Undeclared" summons up that chaos and uses it for comedy, proving we can laugh at anything given enough time. 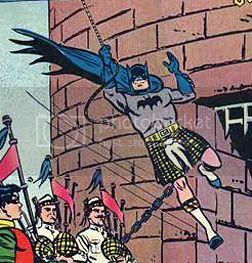 Because it's Monday and I have the day off, these are the kinds of things I have time to think about: Batman in a kilt. 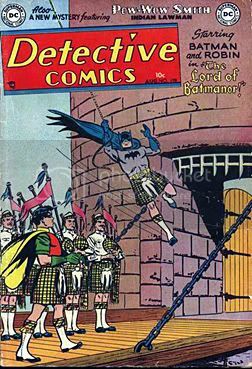 I don't know what scares me more - the fact that Robin is in a kilt, too, or that I'm wondering if Batman is wearing that kilt in the traditional Scottish fashion or not. Holy haggis! THE WEEK OF LISTS: Geography List-A-Palooza! OK, before we conclude THE WEEK OF LISTS, go see "The 40-Year-Old Virgin." Hilarious and sweet, best comedy I've seen this year. And now, multiple lists! 11. The National Mall, Washington, D.C.
1. "How to Say I Am Sorry In Hawaiian." By getting "lei'd." 3. "Reagan" "Captain America." You know, he really wasn't. 4. "Creature from the Black Lagoon metaphors." Sometimes a swamp creature is just a swamp creature. Unless it's the Man-Thing. 5. "Vaya con dios, chili surf." 6. "What did Kate do?" I don't know, but I'm sure Google will tell you. 7. 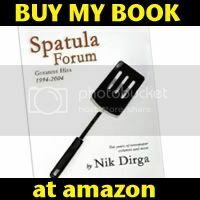 "Painter artist Spatula Sunshine." This will be my new pseudonym. 8. 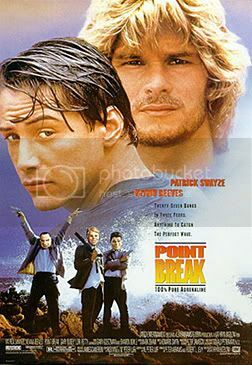 "Utah and Mormon Church references in 'Point Break.'" YES!!! I am the #1, and, um, only hit for this topic. 8.5 ...And weirdly enough, I keep having people searching for me by my first and last name (which are both quite unusual and I feel fairly sure I'm the only me there is). Do you ever wonder who it is that's doing that searching for you? Old friends? Enemies? The IRS? That guy whose beer I spit in back in 1993 at a bar in Mississippi? Egads. Who are you, who are you? Because this is the week of lists, I'm stealing this cool meme from Marc Mason, which asks what five comic book works would you take with you on that mythical ol' desert island (where of course there would be an air-conditioned food-filled old abandoned military base you could read your comics in comfort whilst waiting for rescue). 1. 'The Complete Concrete' by Paul Chadwick. 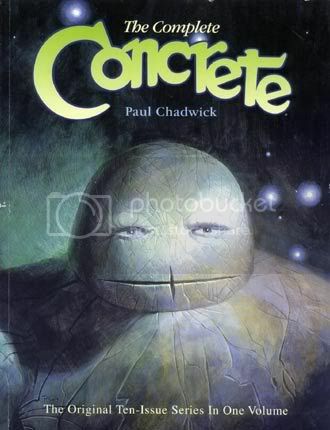 This out-of-print book collects #1-10 of the old Dark Horse "Concrete" series, which may be the finest collective movement in Chadwick's ongoing saga of Ron Lithgow, a thoughtful, passionate man trapped in an isolating alien body. "Concrete" wowed me back when I first read it in the mid-1980s and 20 years on few comic works have been quite as humane, hopeful and insightful. This series rambles from Concrete's origins to Mount Everest, from Nepal to rock concerts and family farms, and is a perfect introduction to the character (while this particular book is hard to find, there are several other reprints of the same material out there). 2. 'Watchmen' by Alan Moore and Dave Gibbons. Jeez, this is a no-brainer, isn't it? If you aren't including this on your desert island list I will gasp, I tell you, gasp in astonishment. The realist superhero epic with an apocalyptic conclusion; remarkable for just how dense it is and how much new you spot on each re-reading. This entire list could be nothing but Alan Moore comics, but if I had to pick one, this would be it. 3. 'The Essential Amazing Spider-Man' Vols. 1-7 by Stan Lee, Steve Ditko, John Romita, etc.. My favorite superhero, one I've followed through thick and thin, dim and great (I did give up for a while during the "clone saga," I admit). In seven gigantic black-and-white "phone books," herein are reprinted the first 15 years or so worth of web-swinging goodness. Essential, fun and old-fashioned superheroics at their best. 4. 'Cerebus: Church And State' Parts one and two by Dave Sim. There are few bigger disappointments in comics for me than "Cerebus," which was my introduction to so-called "indie" comics way back when, which was a magnificent, sprawling epic that sputtered out into obsession and incoherency toward the end. Still, a bad ending doesn't cause the superb early years to lose their merit -- taken on their own, the two massive "Church and State" books are "Cerebus" at its peak, a story of religion, power and madness that (nearly) stands on its own, allowing you to forget the painful long slow downhill slope that began soon after this. 5. 'Tintin' by Herge, the complete works. Man, one of the first comics I fell in love with was Herge's classic European "Tintin" series, about the globetrotting teen reporter and his wacky friends and enemies. My local library had nearly the complete set. Nearly 60 years after most were created, the 15 or so books still hold up wonderfully well as all-ages entertainment, with exquisitely detailed art, fun characters and craftsmanship galore. You could do far worse than introduce a kid to comics with Tintin. Honestly, I'd take the entire library if I could — close runners-up for me would include Miracleman #1-16, James Kochalka's "American Elf," "Like A Velvet Glove Cast In Iron" by Dan Clowes, "Hate" by Peter Bagge, Grant Morrison's run on "JLA," "Animal Man" also by Grant Morrison, Neil Gaiman's complete "Sandman," "Top 10" by Alan Moore, the original Marvel Comics "Star Wars" series trade paperbacks by Dark Horse, "Preacher"... but really, at some point, you're going to run out of island, aren't you? So this week is the week in which all my posts will be in the form of lists. Why? Well, it's August, it's hot, and by gum we all need to do something novel to keep sane. So a grieving mother of a soldier is camped out on President Bush's "White House South" doorstep near Crawford, Texas, where G.W.B. is off vacationing for five weeks or so. Cindy Sheehan of Vacaville, Calif., says she's not leaving until the President comes out and talks to her about why her son, 24-year-old Casey, died in Iraq last year. She says she's going to stay there until Bush talks to her and tells her more about this "noble cause" he keeps calling Iraq. Bush ain't doing it. See, he has fund-raisers to go to instead. I just wonder, though. As of Thursday, Aug. 11, 2005, at least 1,844 members of the U.S. military have died since the beginning of the Iraq war in March 2003, according to an Associated Press count. The small rural community I live in has had two deaths. The community I grew up in just had its first. Imagine if at least two members of each of those 1,844 soldiers' families went down to join Sheehan. That'd be nearly 4,000 people. Heck, toss in the rest of the dead soldiers' families - and their friends. Say 20 people per death. That makes 73,000 people, which is nowhere near the number of lives that have been touched by G.W. 's war. Imagine the noise that could make. Imagine if the President had any inclination to listen to anyone else's opinions. Imagine the world really was a better place as a result of his responses to the tragedy of 9/11. Imagine that open-mindedness and debate wasn't considered weakness. Michael Penn finally has a new album out! This under-the-radar pop tunesmith is someone I've liked for years, but he's not super-prolific - since his first album "March" (and one "hit," the single "No Myth") circa 1989, he's only put out four additional albums. Joe Blow probably knows him better for being the brother of Sean Penn and the husband of also-fine singer Aimee Mann, but he's a great creator on his own, crafting literate, hook-filled pop that's heavily influenced by the "3 B's" – Beatles, Byrds and Bobbie Dylan. So now he's back, but it's with a "concept album," two words that usually make me shiver in fear. I'm not nuts about concept albums, and even the best — Green Day's "American Idiot," "Tommy" by The Who, or "Sgt. Pepper's" — are usually good in spite of their concepts more than anything. Penn's fifth CD, "Mr. Hollywood Jr., 1947," is songs set in and about the strange post-WWII year 1947 in Los Angeles, at least in theory. A lofty concept, but how's the music? Well, it's good, with Penn's distinctive, evocative melancholy drone of a voice and elaborate arrangements. But it's also padded with some filler and lacks the punch of Penn's best, 1989's "March" or 1997's "Resigned." Yet at its finest, it does summon up a kind of lost world, set in the desert heat and broken dreams of LA. On a few listens, a few songs really jump out as up there with Penn's best, such as the gorgeous lament "O.K.," the brooding, anthemic "Walter Reed," or my favorite track, and one of the album's most 'up', "On Automatic." Penn also branches out more musically than before — "Mary Lynn" has a chant-like, Indian feel that brings to mind some of George Harrison's spiritual solo work. One thing that really annoyed me were several tracks that were semi-instrumental filler, wanna-be Radiohead noodling that didn't do a thing for me. I always feel a little cheated by filler, but that's just me. Penn's a cult artist to be sure — can you imagine Mariah Carey writing a concept album set about post-world war lifestyles? But he's got a sure hand for a hook and a cutting lyric, and brings more intelligence and wit to the game than most musicians can dream of. 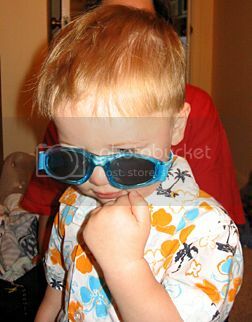 • Witness Peter's first pair of sunglasses! Hurray! And his first Hawaiian shirt! Double hurray! • Still on my Errol Morris kick, I watched 2003's Oscar-winning "The Fog Of War" for the first time the other night. What a movie. You would think a movie that basically consists of one man, former Secretary of Defense Robert MacNamara, talking for nearly two hours, couldn't be that interesting. But MacNamara played a pivotal part in Vietnam, World War II and much of America's war policy in the 20th century. He's been around, and for the movie, Morris dissects his philosophy. MacNamara, now in his late 80s, alternately defends and apologizes for the chaos of war, and offers fascinating insights into how it's waged. What amazes about "The Fog Of War" is seeing how little things have changed since Vietnam. There's a particularly chilling clip featuring Lyndon Johnson talking about hunting down "the enemy" that sounds like it could've been said yesterday by G.W. Thought-provoking and remarkably even-handed documentary work - and I'm torn about MacNamara himself. Even though he's the architect of enormous death and destruction, he seems so gosh-darn nice on camera, and remarkably intelligent and thoughtful for someone in his line of work. We see a level of introspection there that is rare in politicians and soldiers, but at the same time, MacNamera wriggles off the hook at the end when Morris tries to pin him down on whether he feels guilty for Vietnam or not. Highly recommended viewing for students of history, war or just plain ol' human nature. COMICS: Hey kids, graphic novels! 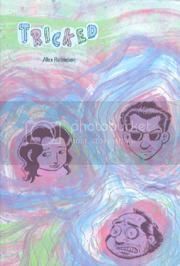 Alex Robinson leapt from minicomics to graphic novels a few years back with the massive, wonderful "Box Office Poison," a tale that featured several friends, lovers and enemies wandering through life in New York City. It was filled with vivid characters and great cartooning, with Robinson's detailed art kind of a combination of Dave Sim and Martin Wagner. Now Robinson's back with "Tricked," which combines "Poison's" character-focused storytelling with a harder, suspenseful thriller vibe. It takes a washed-up rock star, a young waitress, a girl searching for her father, an obsessive crank and several other characters and gradually weaves a story that brings all these unrelated people together for a startling climax. • The Offspring, "Greatest Hits"
• Ray Charles "Ultimate Hit Collection, Disc 2"
• Elvis Costello & The Attractions, "King of America"
• New York Dolls, "New York Dolls"
• The Strokes, "Room on Fire"
• Franz Ferdinand, "Franz Ferdinand"
• They Might Be Giants, "Here Come The ABCs"
• Tom Waits, "Mule Variations"
• Green Day, "American Idiot"
• Colin Hay, "Going Somewhere"
Hey, lookit me! I'm on vacation! My first "away game" blog post. We're down in the mystical land where I grew up, Nevada County, California, visiting my parents for the rest of the week. Today is my Dad's 65th birthday (!!) and we're waiting for my brother to show up and all head out to a celebratory lunch. Mom and Dad gave us the sweet gift of a Peter-free night last night, so Avril and I hit the town, Grass Valley. We hit all the clubs, the tattoo parlors, then the Hell's Angels showed up and... OK, it was actually pretty mellow. We don't take advantage of friends' offers to baby-sit enough back home, so the idea of a leisurely toddler-free dinner and browsing through bookstores capped off by a long walk all sounded pretty decadent to us. It's always strange to go back to your old home town, although I haven't lived in Grass Valley full time since 1990 it's the place where I spent 15 or so very formative years and basically where I think of when I think "home." The curious part is how much has changed and yet how little has changed at the same time -- we're right in the yuppie-fied population boom area east of Sacramento, where all the rich city folk move to retire to the country (and bring their city problems with them, but that's another post). Yet for every fancy development or multi-million Victorian remodeled home for sale, there's the same familiar beat-up gas station or cracked sidewalks or vacant lot full of adventure (how come that hasn't sold yet?) or old downtown library I spent way too much time in as a kid. After dinner last night, Avril and I walked up to the hill to my old junior high, Lyman Gilmore, where I hadn't been in at least 7-8 years. I realized with a unique kind of shock that it's been nearly 20 years since I graduated Gilmore, in a hot and sweaty outdoor ceremony that seemed really fancy at age 14, where I had to wear a tie and surviving photos show a horribly unattractive mullet on my head. Nineteen years on from that 1986 May day, Lyman Gilmore's campus still looks almost exactly the same, right down to the gruesome institutional green-and-gray paint, the low-hanging outdoor walkways, the concrete "airplane" shape on the patio where we played. I could see the stairwells where we'd play incredibly ornate games of D&D, the asphalt where there was assorted humiliations, fast crushes and quick epiphanies. I was there at Gilmore from 5th to 8th grade, ages 12 to nearly 15, which is an incredibly chaotic time in your life. I was scrawny, very short and geeky to the extreme then (hence the stairwell D&D games), yet for all the little awful moments there were some great ones, and I made friends then I still am close to today - I went from playing with Star Wars figures to learning about Depeche Mode, Flaming Carrot, Tom Waits and punk rock, from chasing girls around the playground to fierce crushes on impossibly cool skater-chicks. Weird times, definitely, but unforgettable. I started to feel formed then, for lack of a better word. By summer 1986, I started to shed some geekiness, by freshman year of high school, I'd kissed my first girl out in the heat and stink of exhaust where we lined up for school buses after class, by junior year I'd shot up to 6' 2" and even had a girlfriend or two, by senior year I knew what I wanted to do was write and create and I was ready for the bold adventures of a college on the other side of the country. But a part of me was always that Gilmore geek, and it's a place that's imprinted on me - every little bush, the wing numbers, the spot on the steps where we all hung out imagining how cool we'd be. Twenty freaking years ago, good lord. Now I'm 33, have a kid and a wife and realize you'll never be as cool as you think you'll turn out, but I guess I did all right. Nostalgia. Man, it creeps up on you, doesn't it? Regret to announce I will be on hiatus the rest of the week as we're off to sunny California to visit friends and family, and celebrate my dad's big #65 birthday. Regular communications will resume in a week or so. “Deep Survival: Who Lives, Who Dies, And Why” by Laurence Gonzales. An interesting examination of wilderness situations and how people react to them, encompassing a little bit of adventure, biology and sociology in a fact-filled tome. Gonzales uses plenty of examples and his own history to look at how things go wrong - including an interesting look at the 2002 climbing disaster on Oregon's own Mount Hood. The book bogged down some for me, though, and felt a little overlong and repetitive toward the end, but overall a good read for us "armchair adventurers." “A Treasury of Royal Scandals” by Michael Farquahar is one of those "palate-cleansing" type books you read when you're in the mood for something light and gossipy. It's a great little compendium of violent, deviant or plain oddball behavior by assorted European kings and queens and popes over history. Fun if you're into reading about this kind of thing, although a bit gruesome at points. “Down and Out in Paris and London,” by George Orwell. After reading that biography of Orwell last month, I wanted to check out some of his books I hadn't read, and I've long meant to read this one - a 1920s reporter's journey through the slums and squalor of Paris and London, living hand-to-mouth. Orwell isn't often thought of as a journalist these days, although that was his life's primary focus (that and book criticism). "Down and Out" has Orwell's fine eye for detail and still feels refreshingly contemporary today - remind me never to work in a scuzzy French restaurant's kitchen, OK? Short and snappy, it's Orwell near his best. “Innocent While You Dream: A Tom Waits Reader,” edited by Mac Montandon. Already talked a bit about this book, which is definitely now one of my top 10 books about musicians. Quirky Tom Waits wisdom galore! One more nugget to share from the master, strangely appropriate for this here blog: "Every word has a particular musical sound to it which you may or may not be able to use. Like for example 'spatula,' that's a good word. Sounds like the name of a band. Probably is the name of a band." "The Historian,” by Elizabeth Kostova. Reviewed here. “Harry Potter and the Half-Blood Prince,” by J.K Rowling. And this one I discussed right here. “Making Time: Lillian Moller Gilbreth and a Life Beyond 'Cheaper by the Dozen'” by Jane Lancaster. As a kid I always liked 'Cheaper By The Dozen,' the tale of early 20th-century efficiency experts Frank and Lillian Gilbreth and their 11 (!!) children. So when I saw this serious biography of Lillian Gilbreth at the library, I thought I'd check it out to separate the fact from the fiction of the Gilbreth legend. And it's a fascinating read about an utterly amazing woman — after her husband's early death, Lillian Gilbreth continued to raise her 11 surviving (of 13 total) children, while also becoming a world-famous engineer and an amazing pioneer for women in the workplace. Lillian's life simply astounds - the having 11 kids alone would kill most, but she did so much more with her life, living on into her 90s. The book bogs down a bit for me in the second half, becoming a long list of lectures and travels by Gilbreth, but for all that it's a good read that gives a well-deserved spotlight on a pioneering role model. "No Country For Old Men" by Cormac McCarthy. Cormac McCarthy's a modern Faulkner/Hemingway cross, with taut, tight prose that's lean, cynical, mean and occasionally overwrought. His "Blood Meridian" remains one of the scariest, most apocalyptic books I've ever read. His new one, though, lacks the epic scale of "All The Pretty Horses" or his other classics. It's a stripped-down tale of a Vietnam vet who discovers $2 million at the site of a botched drug deal, and his attempts to flee the drug-dealing psychos who want their money back. It's a good, quick read, but disappointing compared to the weight and power of McCarthy's best. I was particularly put out that a critical plot point near the climax happens "off camera," so to speak. Fine read if you're a fan, but nowhere near his best work.